September has been a busy, busy month, and it’s been one of the least productive in terms of actually getting any writing done. Instead, I’ve spent a considerable amount of time trying to grow some alternative revenue streams, while attempting to keep my existing income steady. It’s been a real slog. But it was totally worth it. The book in question was a re-written version of “Supercharge your Kindle Sales”, with new content and a different cover. With the help of an experienced internet marketer, we were able to recruit 90 affiliates to help us launch this title and drum up over $10,000 of revenue within a couple of weeks. And even more exciting than that – more than 800 people picked up a copy of the book during the launch (at $11.97), and I’ve had a steady flow of emails thanking me for putting this content together. More important than any of the money I’ve made from this, I’m actually helping others get their foothold in the publishing game, which is worth all the effort by itself. The WarriorPlus launch is labelled “Affiliate” here, just to make things line up with previous reports. You can check out my previous three months of sales to see how the above stacks up HERE. You’ll notice Amazon has stayed pretty steady, while other streams have risen and fallen. Is it any wonder why Amazon is the preferred retailer for most self-publishers? My next post is going to cover how to launch a new Kindle release into the top 1,000 paid ranks on Amazon – at full price. I’ve done this three times now, and I’ve got a solid process I’m going to be sharing with you. So, if you’re not signed up for blog posts via email yet, drop your name and email into the signup form below to get updates as they happen. Oh, and go buy my books. They’ll give you inner peace, solve world hunger, and are all an excellent way of eating up space on your internal storage. The paperback versions also make quite serviceable hats. And now I want to hear from you! Are you finding success outside of Amazon or the other retailers? Are you working on anything to expand your product portfolio? I’ve love to hear from you in the comments section – just leave a note below. That’s amazing, Nick. Many congratulatons And thanks for sharing. My income from Kobo and Nook and iTunes is beginning to increase, month on month and starting to make a fair addition to my income. Nothing like the income you’re getting, but heading towards the £200+ a month mark between them. Enough to make the difference between surviving and starving! I hope to find more time for all this analysing and marketing side of the business once I’ve launched the last of my back-list. Great post. Nick. Also, enjoyed your interview on Rocking SPP. I agree about working with Kobo, but, like you, it makes up a very small portion of my total earnings. I’ve actually been thinking of doing the opposite and going KDP Select. I’d like to try it and see if I’ll be able to capitalize on the borrows via Kindle Unlimited. Very interesting. Thanks, Nick, for being so generous in sharing your info. Fascinating, I’ve never heard of WarriorPlus, thank you for sharing. they have some amazing software on there. 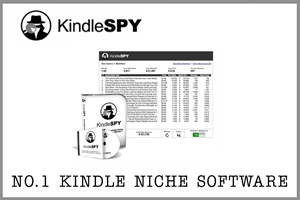 KindleSpy and KindleSamurai are both awesome. Fascinating strategy, Nick. You’re blazing a great trail for others and we appreciate your sharing it. Are you planning to do this for your fiction works as well? Probably not… this particular market is geared towards actionable non-fiction content, so fiction probably won’t work so well (actually, it definitely WON’T work as well). Good insights. Non-fiction is such a different beast than fiction. Do you that find one is easier to sell than the other? You are one of the most enterprising authors I have ever “met”!!! This is astonishing news and congratulations. I guess I have just one question. When do you sleep? Ever? My head reels when thinking about putting in the hours you must put in to do what you do. Just trying to write a book I am always behind on my proposed time schedule, let alone anything else. Mind you, I do have a mother-in-law my wife and I are caring for who is slipping into dementia and demanding more and more of our time, 4 daughters and 5 grandchildren who I also want to share time with ……. life does get in the way even though I am normally an extremely disciplined writer ……but you inspire me and frustrate me and inspire me all over again …… good for you for exploring all these options and thanks so much for your willingness to share your learnings so openly. I learn something new and add something more to my own tool box every time I read your blog or books. Understanding family is what its all about. I could not do what I do without my wife. But what I would give right now for a comfy sofa My mother in law’s is 40 years old and feels like it …. It’s not easy with a young family, good for you for managing it all and getting the results you do with your writing, it’s fabulous. Cheers! Perhaps you could add Scribd’s subscription service to your own list? I went looking for Supercharge there last month but didn’t find it. Congratulations on the successful launch of your revision. 25-35% of my sales income comes from outside Amazon. None of the other stores I’ve sold at amount to much on their own – Amazon outperforms them all in title discoverability – but added together, they’re a sizeable chunk of my income. 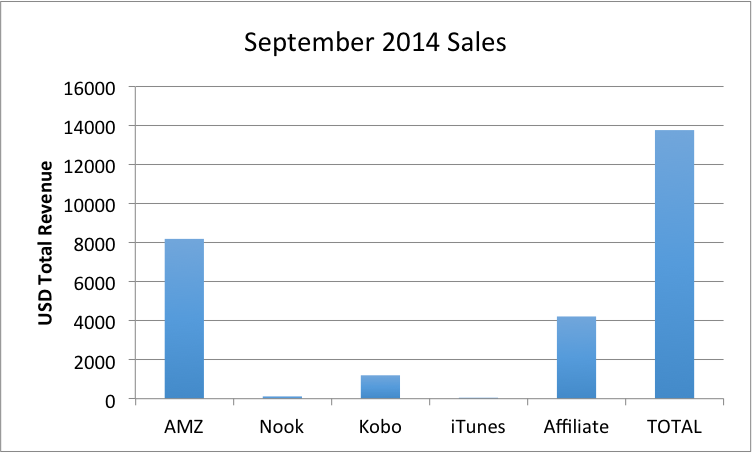 And I know I’m reaching readers who don’t shop for ebooks at Amazon, which is important to me. I’ve had a couple of books on Scribd but not seen much movement there. I do know some people are doing really well from it, and I hope that continues! Congrats, Nick. Thanks so much for sharing your journey. I am glad you found this alternative revenue source and continue to be adventurous with exploring new options. I hope you are having a bit of fun as well. I love this blog! You provide a nice counterpoint to stuff I read all the time. I am wishing you absolutely stupid amounts of money. Well done, sir. Can’t wait for the next post as I have a new release coming up. And I confess I’m a bit intimidated by software and graphs…. What are your thoughts on Pie Charts? Mmmm pie…. Nick You have been so helpful and really helped me get my books on track. After studying your book, ‘Supercharge’ I took the titles and pricing apart then saw tot he websites and now the books are high on the sites and selling really well. So a big thank you. Your energy is incredible. Don’t forget to take the vitamins. Thanks Katy! So glad you’re doing well I’ve got my bottles of vitamins lined up! Good luck Anita! I’ve found having a bunch of books is a good starting point – giving away free copies in exchange for people’s email addresses is key (then you’ve still got full-price ones to sell them too). My latest new fiction release peaked at about 1,200 paid on Kindle. I can pretty much tie my new release performance to my growing mailing list, currently with 1,500 names – of which approximately 20% can be counted on to buy in the first 48-72 hours. Have you experimented with designing a mobile app to build your newsletter subscriptions? I can find NO help on how to construct such an app. It’s definitely worth growing your list – that’s the key to a good launch, as I’m sure you know! I am experimenting with giveaways right now, they seem to be working rather well. More on that when I have the figures! I may steal the idea you used in one of your titles: listing a brief promo link to a free novella in the Book Description section of the Amazon listing page. I think we are quite similar: I too have over a dozen fiction titles and sales approaching the 250,000 mark. I just downloaded Fallen and am looking forward to the read. Yes, that really works well. I get anywhere between 20 – 30 signups a day based on that alone. You can imagine, over time, that adds up pretty quick! And when boosted with a Bookbub ad, I’ve seen that figure hit 800 in 48 hours. These guys tend to stick around as well, so getting them on a (well curated and non-spammy) email list is great. Thanks! I hope you enjoy Fallen!